The first hint of silliness came from a coworker who said “Bless you,” when I sneezed. She waited, expecting a thank you, like a bellhop looking for a tip. She became further irritated later when she sneezed and I didn’t bless her. I don’t think Pope Gregory the Great, who started this little superstition during the Bubonic Plague, expected it to become contentious. And if Medieval denizens were correct, my soul might have escaped through my nose when I sneezed, so I had more important things to worry about. In an effort not to offend, I wish you Happy Holidays or Merry Christmas, or Happy Christmas, or Merry Holidays. I hope I’m covered. Oh, and Happy Saturnalia to my pagan friends. Sorry Jews, you haven’t made enough fuss, and Hanukkah came too early this year. And Kwanza, well people who celebrate that are used to being ignored. I’m not sure who’s not saying Merry Christmas, though. I hear it about 10 times a day. Our Muslim president said over and again on TV last week. My Jewish friend at work even said it to me. There are rumors that atheists out there are snapping at every person who deigns to wish them a Merry Christmas, but I haven’t met these people. And I know atheists; I live in California. Legendary American freethinker, Robert Ingersoll, would probably have at most poked fun at Christmas’s lumbering presence. I’m sure he would have congenially said “Merry Christmas” back to well-meaning Christians. He made his point while keeping long friendships with his Christian opponents. Granted, atheist author and scientist Richard Dawkins might take a crankier approach. However, if non-Christians have any reason for discontent, it is the protest from Christians who feel they are being oppressed in a country where they are the overwhelming majority. It’s like the coach whose football team is up 60-3 and still complains to about officiating. I have never understood why any religion feels the need to be the one, true path to salvation. Likewise, why does the way someone celebrates or greets others at this time of year matter. Several 24 hours ago, I stopped drinking. The first approach of Christmas was reason for anxiety. This was a season during which whiskey flowed and I had done more than my share of damage. On Christmas Eve I felt as fragile as a the decorations on the tree. I did my best to shrink Christmas like the wool Reindeer sweater your great aunt gave you. It was in my interest to watch it pass like any other day. 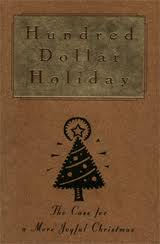 I read a slender book by the environmentalist Bill McKibbens called the Hundred Dollar Holiday: The Case for a More Joyful Christmas, in which he called for simplifying, and then simplifying more. His advice was exactly what I needed as I tried to make a big, loud drunken holiday into something small, quiet and sober. A holiday that had promised regret and disappointment now was simple and reflective. I observed Christmas. I have continued to be something of a wallflower at the Christmas dance, keeping my distance from the noise and size of the season. I am not opposed to Christmas. It is my wife’s favorite time of the year. My children’s too. My daughter’s bedroom looks like a scene from the film “Elf.” We don’t live in a Christian country, but most Americans are Christian. This holiday will never hold the warmth, comfort and magic of childhood. I sought that in deceptive warmth of my special Christmas bottle (which ended up being bottles), but I always ended up filled with regret, and sorrow, a failed father who couldn’t remember his children opening presents. I see no reason to concern myself that this season doesn’t fit my expectations. I have made it an exercise in acceptance, a reminder that all I have is a daily reprieve contingent on the maintenance of my spiritual condition. To do otherwise would be a waste of energy and peace of mind. Christmas concerts have been renamed winter concerts. There are no more manger scenes or Christmas trees at schools. On the other hand there are no Menorahs or Stars of David either. If parents are concerned about the presence of Jesus in their children’s lives, they can do something about that at home. Those who clamor for Christmas and prayer in their schools claim they are only concerned about their children, but I suspect they want things the way they used to be, when they were kids. This desire is as old as civilization. The result is, too. The only thing that stays the same is change. No matter how much we want it–no matter how much whiskey I drank– we’re not going back. The reason is, the next generation doesn’t care. They don’t know any different, except from our stories, and those get boring after a time. They don’t care what their concerts are called. Mostly, they don’t want to sing in them. They don’t notice that there are no Christmas decorations at school. They have them at home. When we look a little deeper at the past we will find that things weren’t as different back then as we remember. Our parents talked a lot about times gone by. Our kids share one very important thing with us. We didn’t care much about what our parents did when they were young either. All we wanted to do was open our presents.